The Budget SLP: Who Rode the Bus? I liked school bus activities in September. 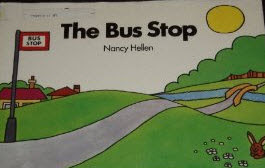 My favorite book The Bus Stop by Nancy Hellen may only be available on ebay or Amazon, but the simple language was just perfect for the early childhood classes. My Tupperware School Bus is another item to look for on ebay or at garage sales. It came completely apart to form a classroom and students loved putting it together. See Who Rode the Bus? at 4GASLPs. This cute story is sung to the tune of "Who Took the Cookie from the Cookie Jar?" 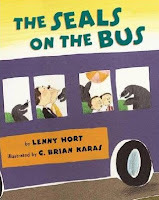 MakeLearningFun.com has story props, a position word activity, an emergent reader and a sign language reader to go along with The Seals on the Bus by Lenny Hort. Make an Egg Cartoon School Bus at DLTK. And, for those of you with Boardmaker, visual suppports for this activity have been posted at BoardmakerShare.com. BoardmakerShare.com also has many bus activities; overlays and visuals for Wheels on the Bus, school bus social stories, and printable and interactive books. I believe there's a similar story in "Noisy Stories" (Mayer Johnson), too, but the pictures aren't as pretty! Thank you for letting me know. I made it years ago to go along with a teacher-made story in one of my EC classrooms. I am now guessing that the teacher did not create it so am taking it off of my blog.